A decade after Marquette’s release by the University of Minnesota, Midwest Wine Press is checking in on its progress with help from Calico Skies winemaker, Will Kimberley. Marquette is one of the only grape varieties capable of making quality dry red wine in the colder parts of our region. The variety was developed by the University of Minnesota’s well respected cold hardy grape breeding program, released in 2006 and is the university’s best-selling grape. Marquette claims Frontenac as a cousin, Pinot Noir as a granddaddy and was developed from a cross of MN 1094 – a complex hybrid including Vitis riparia and Vitis vinifera – with the French hybrid Ravat 262. The grape has high sugar, moderate acidity and good tannin levels. A couple of years ago, at the Minnesota Grape Growers Association’s Cold Climate Conference, there were some very promising medium bodied, lighter red colored Marquettes that were perhaps a little heavy on the oak. At the recent Indy International Wine Competition, hosted by the University of Purdue in West Lafayette, IN, the Marquettes had a deeper red color, a fuller mouthfeel, better balance and more adept use of oak. Winemakers are clearly sharpening their Marquette skills. 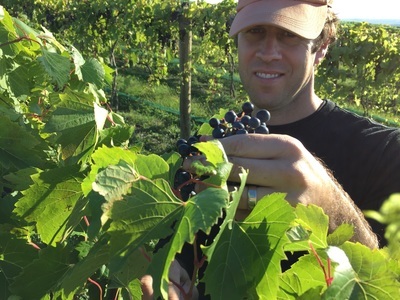 Will Kimberley is winemaker at one of the most northerly vineyards in the state of Iowa. 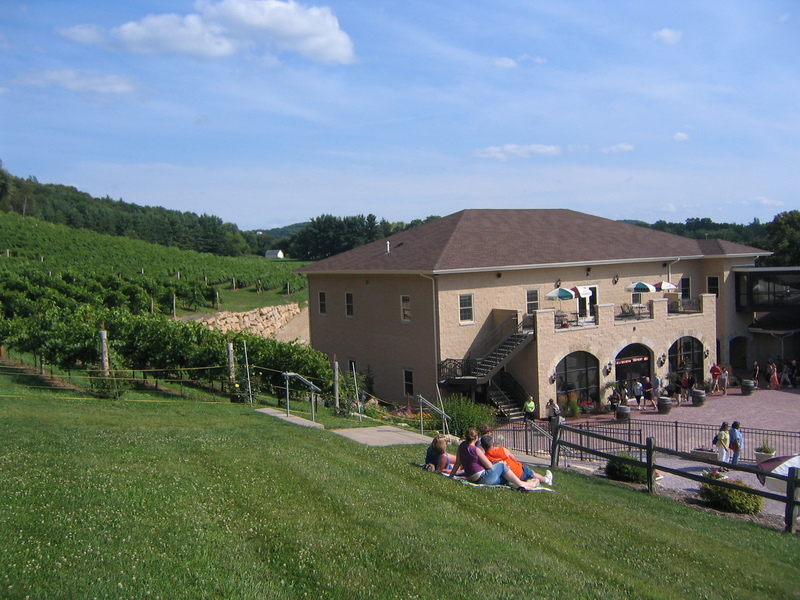 Calico Skies Vineyard and Winery is located in Inwood, a handful of miles from both Minnesota and South Dakota. The Kimberleys chose their site carefully. The winery is on top of a river bluff on land that was pasture for decades. Will says that after about 12 inches of fertile topsoil the earth becomes gravelly and then sandy (a plus in an area where most land is generally too fertile for grapes and used for corn and beans) and the water table is low. Like many varieties grown across the Midwest, not a lot is yet known about Marquette’s specific soil preferences. But Will says their 2 acres are flourishing and the first acre, planted in 2010, managed to survive the brutal 2012 drought without any signs of stress. Eager to get the winemaking operation going, they made 70 gallons of Marquette wine in 2010 using grapes from local growers. It sold out quickly – and not just because there wasn’t very much of it! However, making a crowd pleasing dry red out of Marquette has not been without challenges. During the last six years Will says they’ve learned a lot. For example, to get their preferred dark red color, rather than the light red of their earliest bottlings, has largely been solved by using different Scott Lab products. ‘Color makes a big difference in people’s perception of the mouthfeel and then the complexity of the wine,” says Will. 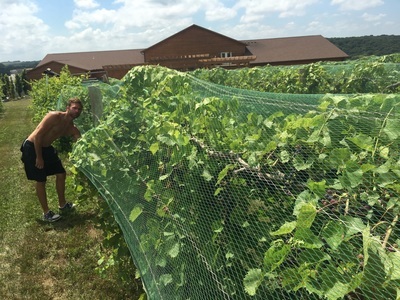 Midwest Wine Press: How did you set up your vineyard and trellis system for Marquette? William Kimberley: We did 10 foot row spacing and 8 foot vine spacing. Our trellis system is a high bilateral cordon so we’ve got two trunks starting from below the soil coming up and getting up to a top wire. Our top wire is at 5 foot 2 because my wife is 5 foot tall! For Marquette, 5 foot works great. We chose 10 feet as the row spacing because it is pretty standard and with the equipment we had at the time we could get our tractor through it. 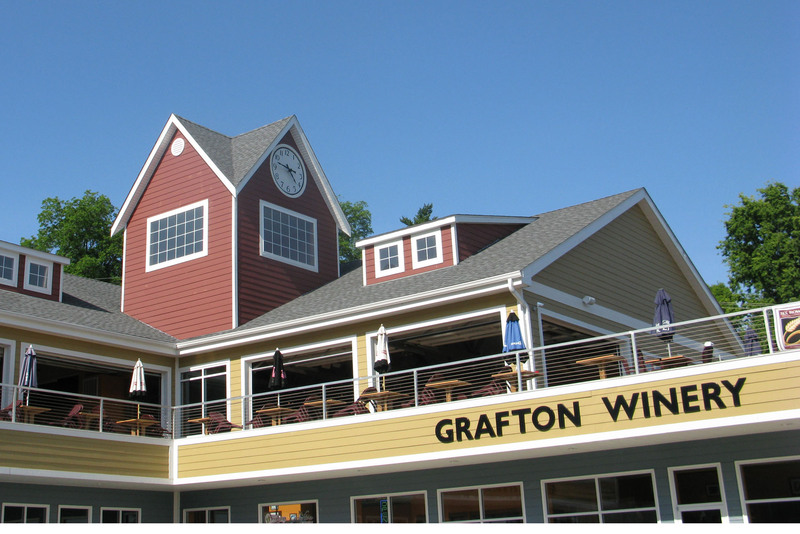 MWP: How have your vineyard practices changed over the last six years for Marquette? WK: Thanks to the weather, grape growing in the Midwest can be really crazy. We were trying a few different things during the last few years but with weather events like the hail in 2014 and 2015 our experiments got thrown through a loop. This year is finally a good year when we can actually try something. What we are really trying to do is stay on top of combing to have a very defined fruiting zone. One of the most important things for us is to be out in the vineyard all season, combing and helping create a good structure for the plant so that the fruiting zone is all very even. Then we do a little bit of leaf pulling and try to give that fruiting zone a good amount of airflow and sun to really mature the grapes evenly. It’s really been about making sure the basics are solid and then from there we’ll have the opportunity to develop things how we want to. MWP: How does Marquette’s growth compare to your other varieties? WK: It’s just a little more vigorous than our Frontenac so it demands constant attention like combing, a little bit of leaf pulling and shoot thinning, especially early in the season. It sustains a good crop load — although not in our hail years when we’ve had a very low crop — but in the good years we’re easily able to get 4 tons an acre which we consider a full yield. MWP: How do you help the vine survive the extreme cold? WK: It does break bud early so frost is something we’re always worried about early in the season. We do what we can as far as the timing of our pruning and we long prune everything, so instead of cutting that branch that we’re going to leave to two or three buds, we pretty much leave the whole branch until the latest date we can to try and slow down those first few buds from coming out of dormancy. That’s worked pretty well. We also use a high potassium anti-frost spray that we use pretty freely with the Marquette to try and get another few degrees of frost protection. MWP: What sort of spray program do you follow? WK: Marquette is pretty good when it comes to disease pressure. We stay on a pretty strict spraying schedule, mostly preventative fungicides which we spray about every 12 days or so based on the Iowa State Extension template. We definitely get the sort of humidity that makes it so that we can’t be organic in our area, in my opinion. 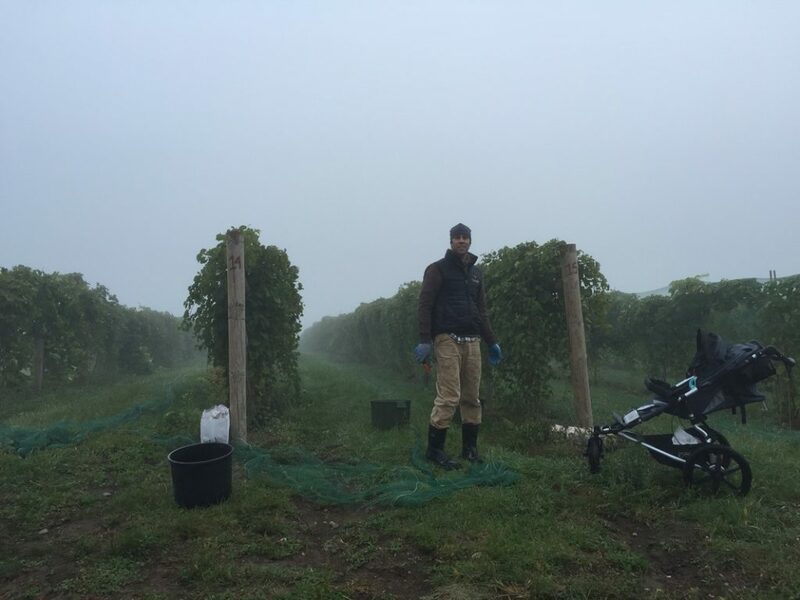 Apart from spraying we also manage the vines to ensure the grape clusters get adequate air flow through the fruiting zone to lessen the chance of disease. But that’s one variety that we haven’t had many issues with at harvest time, like the fruit having rot. We do have a little phylloxera coming in so we’ve started spraying for that but as long as you get the timing right on that it’s not a big deal at all. MWP: What about keeping the soil in good shape? WK: We don’t fertilize heavily but we do put out a little ammonium sulphite every year because soil pH is a little high so they are trying to acidify the soil a little over the next 10 years. So far our vine tissue samples show that we don’t have many deficiencies yet. But we might start a foliar feeding program in the coming years. What kind of ageing potential do you see for Marquette in your vineyard? We just recently drank our last bottle of the 2012 in February 2018 and it was fully mature, smooth and with as much fruit and intensity as it had 3 years ago. Next story Where’s the Local on the Wine List?